James Roday Directs ‘Gravy’, A Comedic-Horror Romp!!! If laughing hysterically while you’re trying not to puke is your favorite mixed feeling, get ready for ‘Gravy‘! Maybe I should add if you’re a fan of Emilio Estevez Esteevez and Bighead, Super Sniffer, Longbranch Pennywhistle or Chocolate Columbo, you’ll be in love with this. Of course, all those names are the many aliases Shawn Spencer uses for himself and that of his faithful friend (Sounds like I’m talking about a puppy, doesn’t it?) and side-kick Burton Guster on the TV series ‘Psych‘. 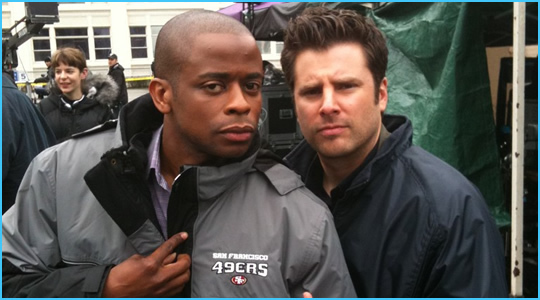 This factors in to ‘Gravy‘ because James Roday is the director of ‘Gravy‘ and he’s brought co-star Dule Hill into the film with him! The premise is simple, hilarious and a little appetite suppressing, which is a win-win for me! It’s All Hallow’s Eve. A trio of costumed misfits with very special dietary requirements seizes a Mexican cantina and forcce the staff to engage in a late night of gaming, food and libations. The only caveat is what’s on the menu. The cast more closely resembles a main-stream film than an Indie pic, and it’s all a perfect fit. Michael Weston (‘Garden State‘), Jimmi Simpson (‘House of Cards‘), Sutton Foster (‘Bunheads‘), Lily Cole (‘Snow White and the Huntsman‘), Paul Rodriguez (‘Ali‘), Dule Hill (‘Ballers‘), Gabourey Sidibe (‘Empire‘) and Sarah Silverman (‘Wreck-It-Ralph‘). The film opens in select markets on October 2 and then is available everywhere on October 6 from Scream Factory. You’ll laugh, you’ll cry, you’ll excrete bodily fluids. Blu-ray Review: ‘Memoirs of an Invisible Man’! 1987’s ‘Zombie High’ Coming to Blu-ray!!! Laugh, Scream and Cry With ‘Krampus’ The Christmas Devil!!! This entry was posted on Monday, September 21st, 2015 at 8:03 am	and is filed under Film, News. You can follow any responses to this entry through the RSS 2.0 feed. You can skip to the end and leave a response. Pinging is currently not allowed. « WWE: O’ What a Night of Champions 2015!